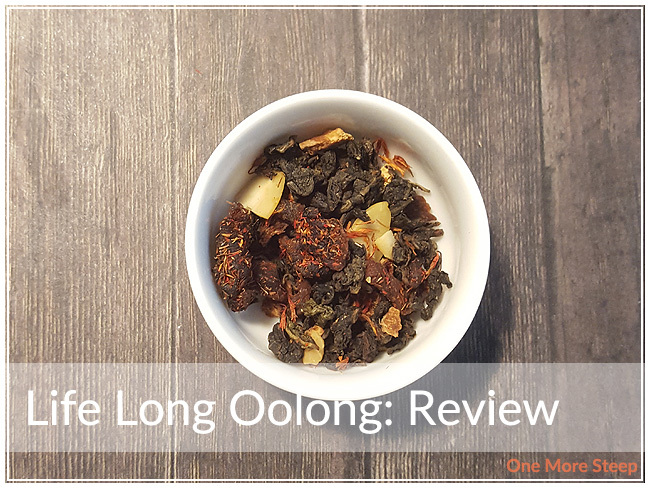 Life Long Oolong is a tea that I had gotten as part of a boxed collection that I had purchased from DavidsTea, it was one of those “Oh, look at what popped into my shopping cart…” moments. Life Long Oolong came in one for DavidsTea’s standard silver resealable bags, which I quite appreciate. Because it came in a box set of teas, this one came heat sealed at the top. Nothing a little ripping action couldn’t fix! Life Long Oolong smells like exactly like peaches – the description given to the tea does not disappoint in that manner. 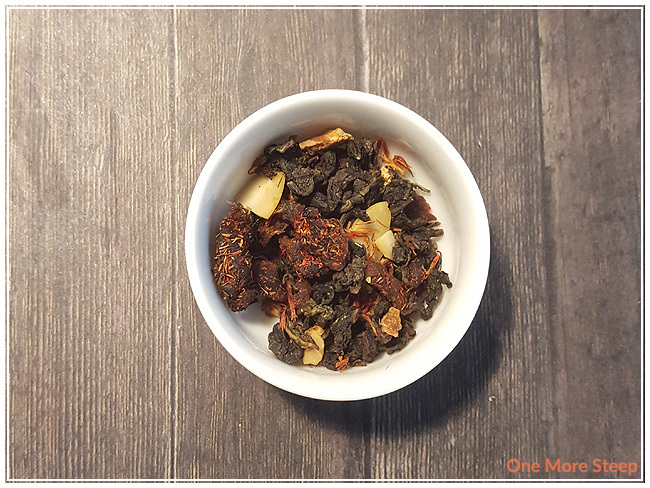 It’s easy to see the oolong mixed in with the other ingredients and it smells quite nice! I like peaches (the fruit) and this reminds me of peaches a lot. 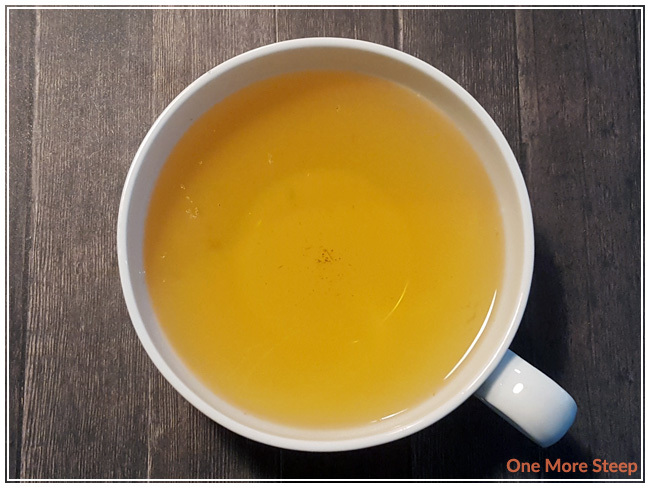 The ingredients for Life Long Oolong are: Shui Xin oolong tea, apricot, peach, almond, orange peel, safflower petals, natural and artificial flavouring. DavidsTea recommends steeping in 85°C (185°F) water for 4 to 7 minutes. I did my first steep for 4 minutes. Life Long Oolong steeps to a beautiful golden orange, the tea leaves unfurl nicely – I would highly recommend giving any oolong room to grow. It is a fairly heavy tea, I find, what with all the additions of fruit and almonds to the tea. After steeping, it smells like peaches and is very close to the pre-steeped dry leaf smell. I found that Life Long Oolong has a very sweet peachy taste to it, and I can make out the oolong base to the tea. The taste of apricots does make its way into the flavour profile and I find it adds just a bit of natural sweetness to the tea. It’s not a tea that needs the addition of sweetener, unless you have an extreme sweet tooth. I think because of the fruit content and the natural sweetness to the tea, it would make a really nice iced tea. That said, it makes a good cup of hot tea as well. I wound up pouring a separate cup with some ice cubes and found it to be delicious and refreshing. We’re going to ignore the fact that I had a cup of iced tea in October. 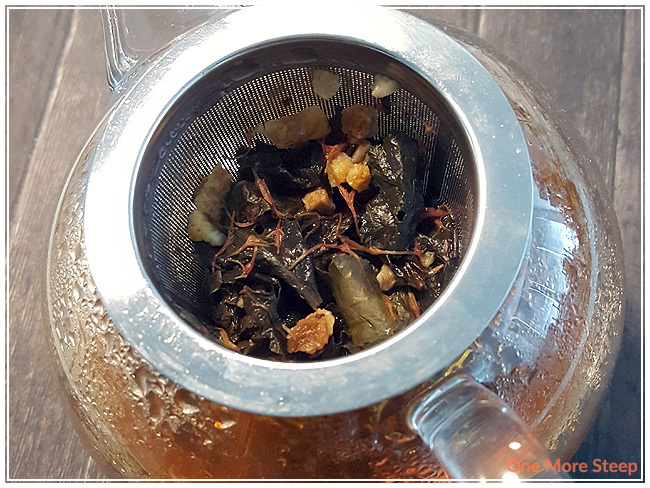 I resteeped Life Long Oolong an additional two times – both times adding about an extra minute to the steeping time (so steep #2 was for 5 minutes, steep #3 was for 6 minutes). I found the peachy flavour of the tea to be the best for first steep, and the flavour and aroma of peach and apricots in the subsequent steeps to be lacking. The second steep isn’t terrible, but the third definitely tastes watered down and anemic in flavour and excitement. 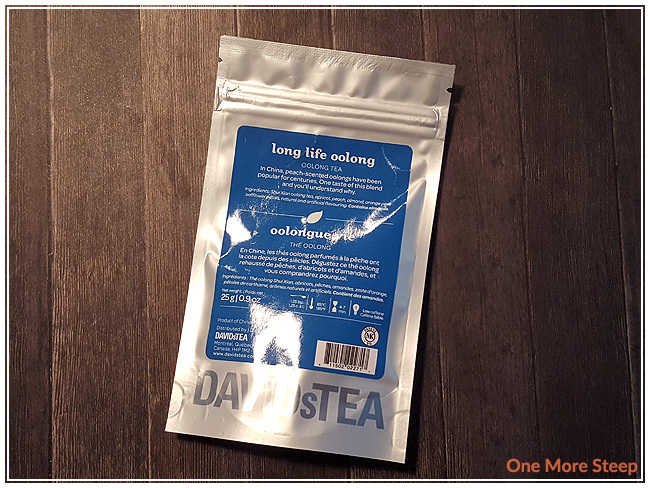 I liked DavidsTea’s Life Long Oolong. The name is fun to say, the tea tastes great, and it does well both hot and cold. That said, it doesn’t do well with resteeping, which is a shame because it does have a tasty oolong base. I found the additional steeps to be poor echoes of the original steeping of Life Long Oolong, which made it disappointing. It’s a one steep wonder, in my opinion. That said, it’s a delicious peachy tea that’s naturally sweetened by all the fruit that’s in it, which is why I gave it three cups out of four. Thank you for the review! I’ve been wanting to try Life long oolong from Davids Tea, but I’m not a big peach fan so I was hesitant. Now I know!